“I recently read yet another statement by a well-known Christian leader confessing sin and asking for forgiveness. 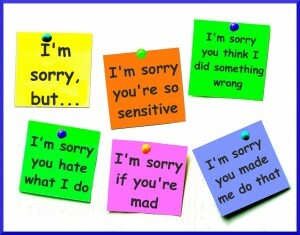 It was one of those apologies that leave you with a bad taste in your mouth. I would say that it was a narcissistic apology…. Read the rest of this article here on Recovering Grace. This entry was posted on Wednesday, May 7th, 2014 at 9:21 pm	and is filed under Counseling, Marriage, Raising Children. You can follow any responses to this entry through the RSS 2.0 feed. Both comments and pings are currently closed. chronically selfish is layman’s term for malignant narcissism or narcissism personality disorder. while i feel psych labels or psych itself has nothing to offer other than just that, a label, it helps us to RUN THE OTHER DIRECTION wen we encounter such an individual. call it wat u want, these ppl are evil. yeah worse than normal evil, like all sinners all.